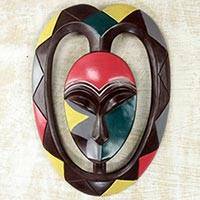 Circular West African Mask Handcrafted and Painted, "Rescued"
Bible stories often inspire Victor Dushie's original designs. Carved by hand from sese wood, a person with a round face shout triumphantly. Parallel lines define the forehead while embossed aluminum adorns the cheeks. 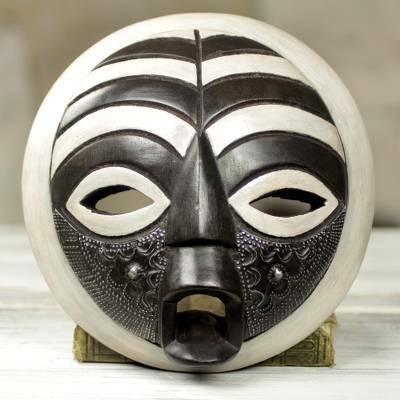 The Ghanaian artisan names this West African mask Edem, which means "God has rescued me" in the Ewe language. Victor Dushie has received 3 microcredit loans with 0% interest from Kiva and Novica, the first for $150 and the most recent for $600. The mask is simply beautiful and well crafted. I am very pleased! “My name is Victor Dushie and I was born in Accra. I grew up in a community of wood carvers and designers, which naturally made me interested in it. I learned from Sasu Kanu, who worked closely with me, teaching by example and helping me practice sanding my creations. “During this time, I learned to master the craft after a lot of practical experience. I find that sanding down the wood has been the main challenge of this art. After completing my training, I also taught two others who actively use their skills. “My creations are made from sese wood, which is readily available in my local markets. I am inspired by the Bible as well as other artists. My favorite part about this craft is designing.